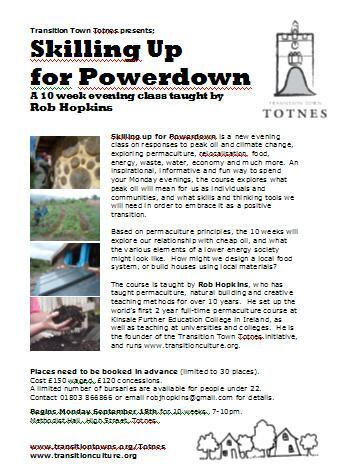 Welcome to **Skilling Up for Powerdown** your 10 week exploration of life in Totnes beyond oil. Over the next ten weeks we will explore a wide range of subjects, and this webpage will offer an extensive resource for further reading and research. It will also feature the results of some of the group brainstorms you will have. It will be updated every week a few days before the class, so try and get into the habit of checking it each week. I hope you enjoy both it and the course, and if you come across something you feel should be included, do feel free to email it to me for inclusion. 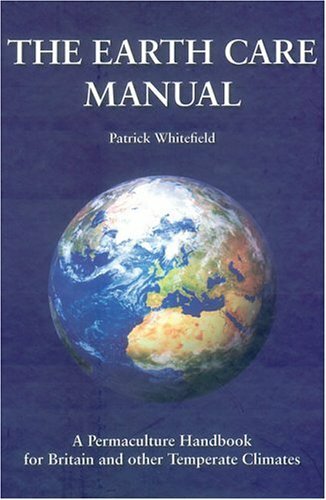 As a reminder, the recommended course book is Patrick Whitefield’s **Earth Care Manual**, published by Permanent Publications. It is the most thorough book on permaculture in temperate countries. You can buy it here. **Week One. 24th September 2007. You’ll find the very good article I referred to about the recent Gulf of Mexico ‘discovery’ here. An excellent recent talk by Richard Heinberg is available here as a sound file you can listen to. You might also enjoy a recent interview I did with Richard while he was in Totnes recently, Part One looked at peak oil and Part Two focused more on solutions. Three good films that are available online are The End of Suburbia, The Real Oil Crisis and Peak Oil. Campbell, C.J. (2005a) *Oil Crisis*. Brentwood, Multi-Science Publishing Co. Ltd.
Heinberg, R. (2003) *The Party’s Over: Oil, War and the Fate of Industrial Societies. * New Society Publishers. 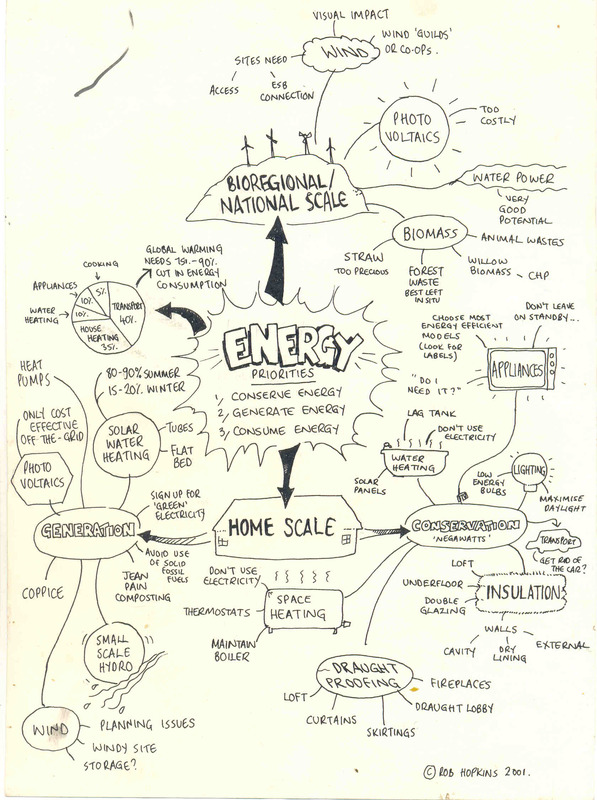 Mobbs, P. (2005) *Energy Beyond Oil. * Leicester, Matador Books. Simmonds, M.R. (2005) *Twilight in the Desert: The Coming Saudi Oil Shock and the World Economy. * New Jersey, Wiley. Hartmann, T. (1999) *The Last Hours of Ancient Sunlight: waking up to personal and global transformation. * London, Hodder & Stoughton. Bakhtiari, A.M.S. (2004) *World Oil Production capacity Model Suggests Peak by 2006-07. * Oil and Gas Journal. 102(16), April 26th 2004. Bentley, R.W. (2002) *Global oil & gas depletion: an overview* Energy Policy 30, pp 189–205. Brown, L.R. (2006a) *Plan B. 2.0: Rescuing a Planet Under Stress and a Civilization in Trouble. * London, W.W. Norton & Co Ltd.
Campbell, C.J. and Laherrere, J. (1998). *The End of Cheap Oil. * Scientific American, Vol. 278, No. 3. pp. 78-83. Chomat, P. (2004) *Oil Addiction – the world in peril. * Florida, Universal Publishing. Deffeyes, K.S. (2001) *Hubbert’s Peak: The Impending World Oil Shortage. * Princeton University Press. Deffeyes, K.S. (2005) *Beyond Oil : The View from Hubbert’s Peak. * New York, Hill and Wang. Fenderson, A. (2004) Peak Oil and Permaculture: David Holmgren on Energy Descent. Published on 7 Jun 2004 by Global Public Media. Greene, G. & Silverthorn, B. (2004) *The End of Suburbia – oil depletion and the collapse of the American Dream. * Electric Wallpaper Company. A DVD Film. Heinberg, R. (2004) *Powerdown – Options and Actions for a Post-Carbon World. * New Society Publishers. Hirsch, R.L. (2005a.) *The Inevitable Peaking of World Oil Production. * Atlantic Council of the United States bulletin. October 2005 XVI(3). Hirsch, R.L. (2005b.) *Supply and Demand. Shaping the peak of world oil production. * World Oil, October 2005. Hirsch, R.L. (2006) Robert Hirsch on Peak Oil Mitigation.. Interview at Global Public Media. Hirsch, R.L., Bezdek, R Wendling, R. (2005a.) *Peaking of World Oil Production – Impacts, Mitigation and Risk Management. * National Energy Technology Laboratory, US Department of Energy. Klare, M. (2002) *Resource Wars – the new landscape of global conflict. * New York, Palgrave Macmillan. Klare, M.T. (2004) *Blood and Oil: The Dangers and Consequences of America’s Growing Dependency on Imported Petroleum (The American Empire Project)*. New York, Metropolitan Books. Kraemer, T.D. (2006) Addicted to Oil: Strategic Implications of American Oil Policy Strategic Studies Institute of the US Army War College. Kunstler, J.H. (2005) *The Long Emergency: Surviving the Converging Catastrophes of the 21st Century*. Atlantic Monthly Press. Leggett, J. (2005b.) *Half Gone – oil, gas, hot air and the global energy crisis. * London, Portobello Books. Murphy, P. & Morgan, F. (2004) *Cuba: Life After Oil. New Solutions. * No. 2 May 2004. Ohio, The Community Solution. Ruppert, M. (2004) *Crossing the Rubicon: The Decline of the American Empire at the End of the Age of Oil. * Gabriola Island, New Society Publishers. Savinar, M. (2004) *The Oil Age is Over Life. * After The Oil Crash Press. Staniford, S. (2006) *Why peak oil is probably about now. * The Oil Drum.com. Retrieved from http://www.theoildrum.com/story/2006/3/1/3402/63420 on Friday, June 16, 2006. Dow, K and Downing, T.A. (2006) *The Atlas of Climate Change*. Earthscan Books. Mayer Hillman (2005). *How to Save The Planet. * Penguin Books. How to remain positive in the face of tremendous change / challenge? How to trigger consciousness / awareness in the public? What to do with / how to adapt existing infrastructure – sewage, transport system, food supply? Many medicines made with petrochemicals – alternatives? Food – can we grow enough? Variety and seasonality? Energy – most homes currently dependent on oil/gas; schools and hospitals? What are the alternatives? Building – what materials can be used? How to do it? Without machinery? Creating support systems, using traditional / tribal models? Holmgren, D. (2004) *Permaculture- principles and pathways beyond sustainability*. Holmgren Design Press. You can read my review of this book here. Whitefield, P. (2005) *The Earth Care Manual*. Permanent Publications. You can see my review here. Whitefield, P. (2000) *Permaculture in a Nutshell*. Permanent Publications. A good light introduction. Also highly recommended is a subscription to the Permaculture Magazine. There is also a great interview with David Holmgren here, and recent talks by him here and here. You can hear in interview with Bill Mollison here. A useful overview of permaculture can be found on Wikipedia. A good article by David Holmgren looking at the principles we explored can be found on his site, click on ‘Writings’ and then the fourth section down, ‘Essence of Permaculture’. 4. Zone, Sector and Slope. As to what they actually mean, all will become clear on Monday night (hopefully!). **Zone 0** – The house or other centre of activity. **For Next Week. ** Have a look at Caroline Lucas’ new report, Fuelling a Food Crisis which you can read online. If nothing else, just read the introduction, but if you can read more you will find it very useful. This is part one of Bill Mollison’s classic film **In Grave Danger of Falling Food**, well worth watching, the first thing I saw about permaculture. To begin with, here are the statistics I began the session with…. * 21% of total UK energy use is in food supply. * Supplying the food to each UK household requires 10 barrels of crude oil each year. * Imports of vegetables have doubled, of fruits have tripled. * 50% of veg and 95% of fruit in the UK is imported. * Over half of food imported into the UK in 2002 was indigenous produce. >“In 2004 the UK imported 17.2 million kilos of chocolate-covered waffles and wafers and exported 17.6 million kilos: we imported 10.2 million kilos of milk and cream by weight, from France and exported 9.9 million. The figures for the same trade with Germany were 15.5 million kilos and 17.2 million. Germany sent us 1.5 million kilos of potatoes and we sent them, yes, 1.5 million kilos of potatoes. We imported 43,000 scarves from Canada and exported 39,000. Drink is swilling around the international markets. The UK imported £310 million worth of beer in 2004 and exported £313 million worth. For spirits the figures were £344 million and £463 respectively”?. New Economics Foundation. ‘The UK Interdependence Report’ (2006). 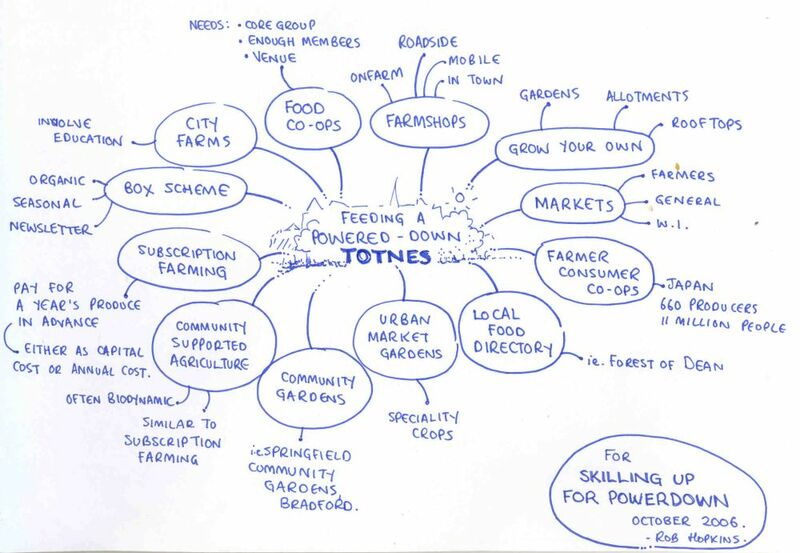 Much of the information I mentioned about town scale food strategies came from a chapter I wrote for a book a few years ago called The Food Producing Neighbourhood which you can find here. The best report on the oil dependency of our food system was produced by Sustain and is called Eating Oil – food supply in a changing climate. Also an excellent article called The Food We Eat – following the food chain back to Iraq. A wonderful new book on rethinking our cities as farms is Andre Viljoen’s ‘Continuous Productive Urban Landscapes’. You can read my review of it here. There is also some great stuff about involving kids in growing food in schools. Whitefield, P. (2005) *The Earth Care Manual*. Permanent Publications. By now this should be your bible! You can see my review here. Fern, K. (1997) *Plants for a Future: Edible and Useful Plants for a Healthier World. * Permanent Publications. Indispensible guide to unusual plants and their possibilities. Jeavons, J. (2005) *How to grow more vegetables than you ever thought possible on less land than you can imagine. * Ten Speed Press. The guide to growing very high yields of food very intensively. A classic and rightly so. Whitefield, P. (1996) *How to Make a Forest Garden. * Permanent Publications. Does everything it says on the tin really. Larkcom, J. (1998) *Grow Your Own. * Frances Lincoln. One of the better ‘everything a gardener needs to know’ books. Fits in a (large) pocket. Guerra, M. (2005) *The Edible Container Garden: Fresh Food from Tiny Spaces. * Gaia Books. 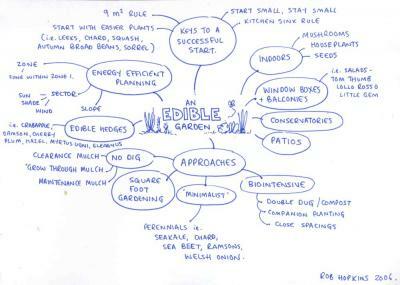 An excellent permaculture guide to an abundant back yard. Bartholemew, M. (2006) *All New Square Foot Gardening: Grow More in Less Space! * Cool Springs Press. A simple approach for maximum output from very small spaces. Stout, R. (1976) *The No Work Garden Book. * White Lion Publishers. Out of print but findable second hand. Here is a review I wrote a while ago giving a round up of all the different books in print on growing food in small spaces. Here is a lovely resource on square foot gardening and making the most of small spaces. Most of the slides I showed were of building projects I have done myself, you can find more information about each of them here. 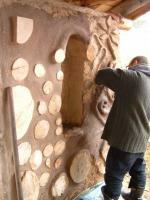 Evans, I, Smith, M & Smiley, L. (2002) *Hand Sculpted House – a practical and philosophical guide to building a cob cottage. * Chelsea Green. Quite simply the best book on natural building, and on the philosophy of ‘small is beautiful’ as applied to houses. Alexander, C. et.al. (1977) *A Pattern Language. * Oxford University Press. An essential book on design, identifying a number of subtle ‘patterns’ that make buildings either work or not work. A seminal piece of work, one of few books worthy of being called genius. Magwood, C & Mack, P. (2000) *Straw Bale Building – how to plan, design and build with straw. * New Society Publishing. Probably the best strawbale building book around. Clifton-Taylor, A. (1987) *The Pattern of English Building (4th edition). * Faber and Faber. An amazing book on the vernacular building traditions of the UK. A scholarly yet readable guide to all the elements (stone, timber, cob etc) that made up our architectural heritage. Day, C. (2003) *Consensus Design – socially inclusive process. * Architectural Press. A wonderful book which offers an entirely new way of approaching building design, by starting with a detailed reading of the landscape and assessing what the land would ‘want’ to be built. Compassionate architecture at its finest. Roy, R. (2003) *Cordwood Building – state of the art. * New Society Publishing. A very thorough guide to cordwood building. Borer, P & Harris, C. (2000) *The Whole House Book. * CAT Publications. One of the best overview ‘what is green building’ books. Kennedy, J., Smith, M. and Wanek, C. eds. (2002). *The Art of Natural Building: Design, Construction, Resources*. Gabriola Island, BC. New Society Publishers. A very good overview of natural building approaches. Woolley, T. (2006) *Natural Building: A Guide to Materials and Techniques. * The Crowood Press. A new and very thorough overview of natural building, in a more UK/Ireland context than many of the other books. There is a nice article about cob here and a good overview of the Passive House concept here. Kevin McCabe is at www.buildsomethingbeautiful.com. You might like to see the Podcasts from the recent Soil Association conference. They give a very good overview of peak oil and agriculture and sum up much of what we looked at last week. Welcome back! Hope you had a good break. 33% gets flushed down the loo, 25% is used washing ourselves, 18% is spent on drinking and in preparing food, 12.5% is used in our laundry, 8.5% is used when we do the dishes, and 3% is used to wash the car and water our extensive vegetable gardens! Jenkins, J. (2006) *The Humanure Handbook – A Guide To Composting Human Manure. * (3rd Edition) Jenkins Publications. My favourite book on composting toilets, so simple, so effective. A wonderful mix of science, humour and common sense. Harper, P & Halestrap, L. (1999) *Lifting The Lid; An ecological approach to toilet systems. * CAT Publications. A very thorough overview of the compost toilet options available to you, covered in typical CAT thoroughness. Grant, N, Moodie, M & Weedon, C. (2005) *Sewage Solutions – Answering the Call of Nature. * (3rd edition). CAT Publications. In the same series as the above, but looks at water-based toilet systems and reed beds. Del Porto, D & Steinfeld, C. (1999) *The Composting Toilet System Book. * Sustainable Strategies Publishing. A nice round up of different peoples’ compost loos in the US. Van der Ryn, S. (1995) *The Toilet Papers: Recycling Waste and Conserving Water. * Chelsea Green Publishing. Slightly dated but timeless none the same. A compost toilet classic (yes, there are such things!). Clift, J & Cuthbert, A. (2006) *Water: Use less, save more. 100 water-saving tips for the home. * Green Books, Totnes. Simple and useful. Ludwig, A. (1995) *Create an Oasis with Greywater – Your Complete Guide to Choosing, Building and Using Greywater Systems. * Oasis Design Press. One of the classics on ways of using grey water. Roulac, J. (2003) *Backyard Composting. * Green Books. Scott, N. (2003) *Composting for All. * Green Books. Campbell, S. (1998) *Let it Rot! Gardener’s Guide to Composting. * Storey Books. Pears, P. (2004) *Compost: Green Essentials – Organic Guides. * Impact Publishing. 1. **The Area of the Roof. ** Take this as being the floor area of the house. 2. **The Runoff Co-efficient. ** This allows for loss of rainwater, from evaporation or from overflows before it reaches the tanks. For pitched roofs you can have a figure of 0.7, flatter roofs are lower, at 0.5. 3. **The Efficiency of the Filter. ** These filter out leaves and dirt, and lose a small amount of water. Depending on the filter, insert a figure of 0.8 or 0.9. 4. **Annual Rainfall. ** For Totnes, the closest figure I can find is around 1000mm per year. Using these, your formula is: roof area in m2 x runoff coefficient x filter efficiency x rainfall in mm = annual yield in litres. So, for a house in Totnes with a pitched roof, it’d be roof area in m2 x 0.7 x 0.9 x 1000 = ? A very thorough collection of resources to do with Humanure Composting. Here is a bit on how to build a Humanure toilet, and also how to use one. 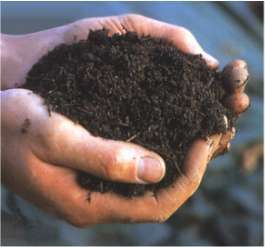 Some good advice on how to make good compost from the HDRA. There’s also a nice straightforward step-by-step guide to composting here. You might also find CompostGuide.com useful. A range of good compost bins are available from the Green Shop near Stroud (they do mail order). Rainwater Harvesting Systems near Stroud sell all you need for rainwater harvesting, as do ISS Solutions for Water and FreeRain. I have always been disastrous at worm composting, but you might get it to work for you. There is also a rather sweet video made by a community in London about how to build compost bins for a community composting scheme. Also, South West Water offer cheap compost bins and rainwater barrels…. you can find out more at the SWW website. Finally, you may enjoy this compost toilet-related film made on the recent TTT video making course. The Energy Savings Trust. Offer independent advice and information about renewable energy options, and the availability of grants. Energy Future . Aims to clear away the confusion and dispel the myths and misconceptions about topics such as climate change and DIY energy. Clift, J. & Cuthbert, A. 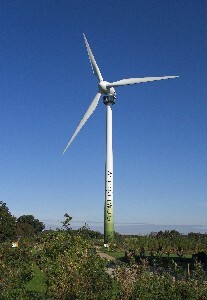 (2006) *Energy: use less – save more. * Green Books. Just published, a pocket sized but very informative guide to energy saving. Mobbs, P. (2005) *Energy Beyond Oil*. Matador Books. What are the energy options for the UK in the light of peak oil? One of the best books on the subject. Casten, T.R. & Downes, B (2005) *Critical Thinking About Energy – The Case for Decentralized Generation of Electricity* – January 2005. Simms, A., Kjell, P & Woodward, D. (2005) Mirage and Oasis – energy choices in an age of global warming New Economics Foundation, London. Greenpeace. 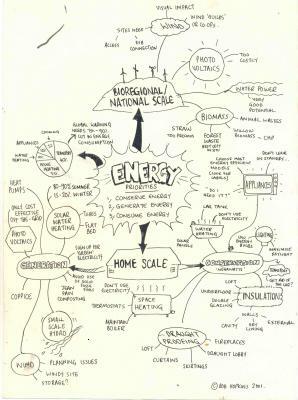 (2005) Decentralising Power – an energy revolution for the 21st century. A very thorough report on decentralised energy systems. You can read about Jean Pain composting here and here. 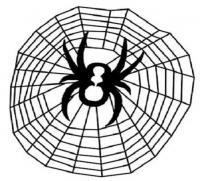 Here is a link to an article about the excellent Ballytobin Anaerobic digestor in Ireland. You can watch an excellent film produced by Greenpeace about decentralised energy systems here. Some useful stuff about smallscale alcohol production can be found here. A recent article in the Guardian gave some useful information on the financial payback of various renewable options. You can buy the reflective panels that go behind radiators here. A useful reference on woodchips is here, a good place to start with on the subject. Your first port of call for advice and for information about grants and installers is the Devon Energy Efficiency Advice Centre in Plymouth who can be phoned on 0800 512 012. They offer a very good service. There is also a very good article on where the real energy savings are to be made in the house, and it may not necessarily be leaving things on standby!! First things first, here is Justin West’s Powerpoint Presentation on Forest Gardens. Secondly, a few years ago I wrote and illustrated a (hopefully) useful ‘beginners guide’ to sustainable woodland management which you can download here. One of the best places to learn woodland skills is from the British Trust for Conservation Volunteers. You can find some good chestnut recipes [here]. The Agroforestry Research Trust, your local resource for advice and trees, has a website full of things you will want to get your hands on, as well as authoritative publications on all aspects of agroforestry. Hart, R. (1987) *Forest Gardening. * Green Books. Where it all started. Whitefield, P. (1997) *How to Make a Forest Garden. * Permanent Publications. The best beginner’s guide. Jacke, D. (2006) *Edible Forest Gardens* (Volumes 1 & 2) Chelsea Green Publications. The master work on the subject. Brilliant, but not for beginners. Baker, H. (1999) *Growing Fruit (Royal Horticultural Society’s Encyclopaedia of Practical Gardening)*. Mitchell Beazley. Berry, S. (2004) *Kitchen Harvest: A Cook’s Guide to Growing Organic Fruit, Vegetables and Herbs in Containers* Frances Lincoln. Simms, C. (2004) *Nutshell Guide to Growing Figs: Everything You Need to Know in a Nutshell. * Orchard House Books. Simms, C. (2004) *Nutshell Guide to Growing Grapes: Everything You Need to Know in a Nutshell. * Orchard House Books. Flowerdew, B. (2000) *Bob Flowerdew’s Complete Fruit Book: A Definitive Sourcebook to Growing, Harvesting and Cooking Fruit. * Kyle Cathie Books. Guerra, M. (2005) *The Edible Container Garden: Fresh Food from Tiny Spaces. * Gaia Books. Where I got all the specifications on pot sizes for trees in small back gardens (or front gardens for that matter I suppose…). Brooke, A. (1980) *Woodlands: a practical handbook. * BTCV. Evans, J. (1984) *Silviculture of Broadleaved Woodlands – Forestry Commission Bulletin 62. * HMSO, London. Marsh, S. (1993) *Nature Conservation in Community Forests. * London Ecology Unit. Ecology Handbook 23. Peterken, G. (1993) *Natural Woodland. * Cambridge University Press. UK Forestry Commission. (1994) *Creating New Native Woodlands. * UK Forestry Commission. UK Forestry Commission. (1992) *Establishing Farm Woodlands. * UK Forestry Commission. Law, B. (2001) *The Woodland Way: A Permaculture Approach to Sustainable Woodland Management. * Permanent Publications. Broad, K. (1998) *Caring for Small Woods. * Earthscan. *Walnuts: Production and Culture*. Available from the Agroforestry Research Trust. Simms, C. (2006) *Nutshell Guide to Growing Hazelnuts. * Orchard House Books. Simms, C. (2003) *Nutshell Guide to Growing Walnuts* Orchard House Books. Apples, Pears, Plums, Damsons, Cherry Plum, Peaches, Crab Apple, Sweet chestnut, Walnut, Butternut, Shagbark hickory, Oak, Monkey-Puzzle tree, Stone pine. 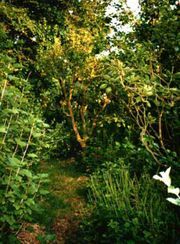 Apples, Pears, Plums, Juneberry, Damsons (all on smaller root-stocks), Cherries, Figs, Medlar, Juniper, Quince, Mulberry, Rowan, Whitebeam, Wild Service Tree, Bollwyler Pear, Strawberry Tree, Sumach, Hawthorn. Gooseberries, Hazels, Elder, Lime, Blackcurrants, Jostaberry, Worcesterberry, Roses, Blackberries, Japanese Wineberry, Tayberry, Loganberry, Blueberry, Boysenberry, Kiwi fruits, Raspberry, Thimbleberry, Oregon Grape, Salmonberry. Bergamot, Borage, Buckwheat, Chard, Comfrey, French/African Marigold, Garlic Mustard, Good King Henry, Horseradish, ‘Jack-by-the-Hedge’, Perennial Kale, Lamb’s Lettuce, Land cress, Lemon Balm, Lovage, Lucerne, Marigold, Mint, Nettles, ‘Nine Star’ perennial Broccoli, Orach, Salad Burnet, Sage, Soapwort, Sorrel, Spinach, Sweet Cicely, Tansy, Chickweed. Dewberry, Alpine Strawberry, Lady’s Mantle, Japanese strawberry-raspberry, Buckler leafed Sorrel, Wild Strawberry, Golden Saxifrage, Poached egg plant, White Clover, Meadow Cranesbill, Ramping Cranesbill, Pink Purslane, Ramsons, Creeping Dogwood. Grapes, Nasturtium, Runner beans, Roses, Hops. Radish, Hamburg parsley, Dandelion, Horseradish. Balm, Barberry, Borage, Broom, Buckwheat, Comfrey, Jack-by-the-Hedge, Lady’s Mantle, Marigold, Mint, Nasturtium, Sage, Soapwort, Sweet Cicely, Tansy, Woundwort. Catnip, Centaury, Fennel, Feverfew, Goat’s Rue, Horehound, Hyssop, Lavender, Marjoram, Rosemary, Rue, Southernwood, Teasel, Thyme, Wormwood, Yarrow. The book I mentioned as a must-read is Masanobu Fukuoka’s book ‘ The One Straw Revolution’. Here is a list of links that Sophie recommends. [[http://www.joannamacy.net]] One of the foremost activists, thinkers and teachers in what she calls “The Great Turning”. Chris Johnstone’s site for his e-newsletter and events listing relating to Transition / the Great Turning. The Pachamama Alliance The pachamama alliance brings together the Achuar indigenous people of Ecuador with people from the US to “change the dream of the north”. It offers information, resources, workshops and more. Be The Change From the Gandhi quote “Be the change you want to see”. Organises an annual conference, works in business. Also Ecopsychology.org, [Hellinger.org])http://www.hellinger.co.uk”H”) and a great site about the Continuum Concept. Joanna Macy & Molly Young Brown. *Coming Back To Life Practices To Reconnect Our Lives, Our World* New Society Publishers For The First Three Chapters. Theodore Roszak (Ed) *Ecopsychology* Sierra Club Books. Many of these are available from GreenSpirit Books. First place to start is this film, “Money as Debt”, which is a good overview of how the money system works. You will find the links to the next part following on after it. It is well worth watching the full 47 minutes. Then it is time to start looking some of the work of those starting to explore solutions. E.F.Schumacher Society on Local Currencies. A History of Local Currencies. Boyle, D. (2002). *The Money Changers – currency reform from aristotle to e-cash. * Earthscan. A good ‘reader’ of short articles on different approaches. Lietaer, B. (2001) *The Future of Money – creating new wealth, work and a wiser world*. Century Books. Douthwaite, R. (1996) *Short Circuit – Strengthening local economies for security in an unstable world. * Green Books/ISEC. This book is now available online for free. If you read just one book on alternative economics, read this one. Douthwaite, R. (2000) *The Ecology of Money. * Schumacher Briefing/ Green Books. This book is available free online here. Greco, T. H. (2001) *Money -Understanding and Creating Alternatives to Legal Tender. * Chelsea Green publishing. Kennedy, M. (1995) Interest and Inflation Free Money: Creating an exchange medium that works for everybody and protects the earth. Seva International. Free download. Korten, D. (1996) *When Corporations Rule the World. * Berrett Koehler. Macarov, D. (2003) *What the Market Does to People – Privatization, Globalization and Poverty. * Zed Books. McIntosh, A. (2004) *Soul and Soil – People versus Corporate Power. * Aurum Press. Bonner, W. & Wiggin, A. (2005) *Empire of Debt: The Rise of an Epic Financial Crisis* John Wiley publishing. Robertson, J. (1998) *Transforming Economic Life: A Millennial Change (Schumacher Briefings). * Green Books. Rowbotham, M. (1998) *The Grip of Death – modern money, debt slavery and destructive economics. * Jon Carpenter books. Rowbotham, M. (2000) *Goodbye America – Globalisation, debt and the dollar empire. * Jon Carpenter books. Schumacher, E.F. (1993) *Small is Beautiful: A Study of Economics as if People Mattered. * Vintage.